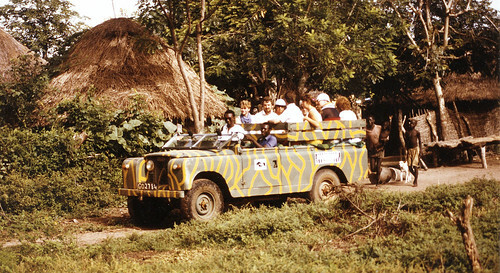 Tourists are taken on a "Jeep Safari" past a village in the West African country of the Gambia. Photo taken in 1984. A former part of the British Empire, Gambia became an independent country in 1965. In the past the Gambia was one of the main places where locals were captured and sold into the slave trade of the West. Famously the book and TV series "Roots" told the story of one of those people and his descendants. Now, The Gambia is a very popular Winter tourist destination where the locals are very friendly, costs are low and there are superb beaches facing the Atlantic Ocean.